Home > Outlook Briefs > Pulse: Financing Energy Efficiency in India - Who Will Invest? The techniques and technologies to improve industrial energy efficiency have been well proven but a notable challenge for policy makers is to accelerate their adoption. PAT (Perform Achieve trade) scheme is definitely a positive step in this direction but Indian industry still has a fair ground to cover. Sustainability Outlook and AEEE engaged multiple stakeholders including industry (PAT Designated Consumers), financial institutions as also Energy Services Companies (ESCOs) to understand the current state of industrial energy efficiency financing. In the May 2016 issue of PAT Pulse, investment potential of industrial energy efficiency interventions for the DCs across PAT sectors (excluding thermal power sector), to be about Rs. 34,000 crore (~USD5 billion) by 2020. In this current issue of PAT Pulse, Sustainability Outlook and AEEE have taken a step further and explored the dynamics of industrial energy efficiency market from a financing point of view. The key objectives of this brief are to analyze the most optimal financing routes to realize the investment potential presented in the energy efficiency domain in PAT sectors (excluding thermal power sector) and to assess strengthening measures needed for achieving a successful and sustainable trajectory for industrial energy efficiency market in India. Size of the Designated Consumer (and/or its parent). Those with fixed assets of Rs. 500 crore and above have been classified as “large”; and others are small. Whether companies will put in their share of contribution as part of the overall financing; or expect 3rd parties to do so. Out of the total financing potential of Rs 34,000 crores (USD 5 bn), 50% or about Rs. 16,600 crore (USD 2.5bn) can be financed by loans within existing lines of credit.Rs 1400 crore (~USD 200m) is the unmet need with existing financing instruments. 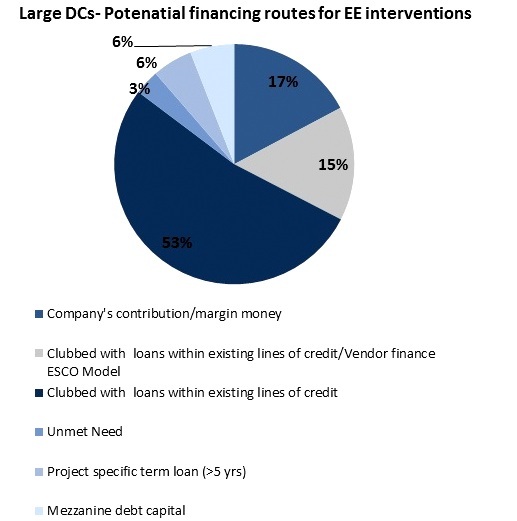 About 16% or ~Rs 5,200 crore (USD 800m) could be financed either by existing credit lines or through vendor finance ESCO Model depending on the preference of the DC undertaking the intervention. If the DC has the ability to bring its (equity) contribution to the project, then it is likely to get financed through existing lines. Otherwise it would get financed through vendor financed lines/ supplier credit. 5% or Rs1700 crores (USD 260m) from the remaining can be supported by project specific term loan (with greater than 5 year tenure), about 5% or Rs 1800 crores (USD 277m) through mezzanine debt crores and about 3% of the total investment potential, i.e Rs. 909 crores (USD 140m) exclusively through Pay for performance ESCO model. 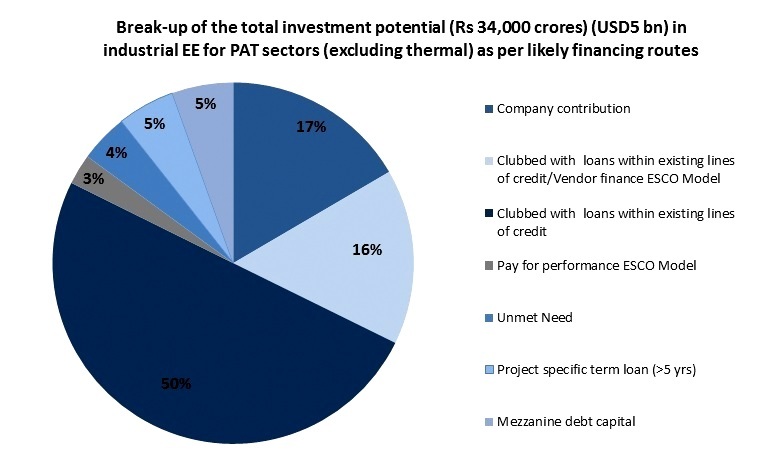 As per Sustainability Outlook and AEEE's estimates,about 4% or Rs 1400 crores (USD200m) of financing need maybe unmet with the existing financing options. While 212 of the total 334 DCs (excluding thermal power plants sector) considered in this study are large (whose fixed assets are less than Rs 500 crores) , remaining 122 are small DCs. 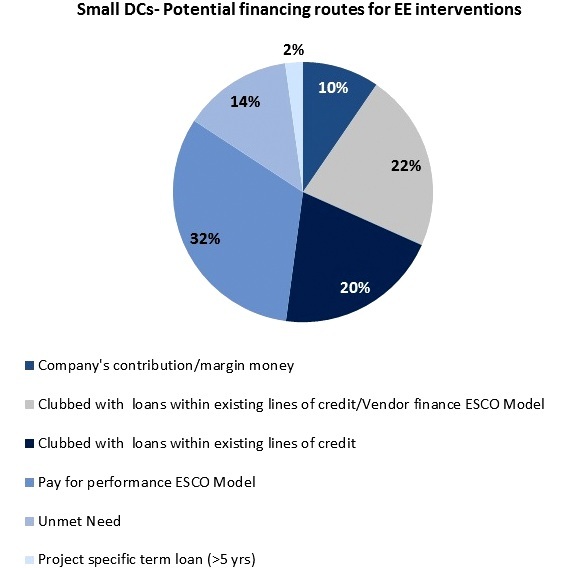 Within the large DCs, those with large balance sheets, who have strong existing relationships with banks, the most likely and optimal route for energy efficiency interventions is clubbing the financing requirements with existing lines of credit. While this route can account for upto 53% or about Rs. 16,000 crore of the total Rs. 25,400 crore investment potential for large DCs, the remaining investment potential can be potentially split across project specific term loans (>5 yrs tenure) (5%) and mezzanine debt capital (6%).However, with smaller DCs (whose fixed assets are less than Rs 500 crores) the story is different. There is a larger potential of pay for performance ESCO model with 32% (Rs.900 crore ) of the total EE investment potential potentially getting funded through that route and another 22% (Rs 610 crores) getting split between vendor finance ESCO model and getting clubbed with existing loans. The brief also provides a detailed illustration of sector wise break up of potential financing routes in industrial energy efficiency. 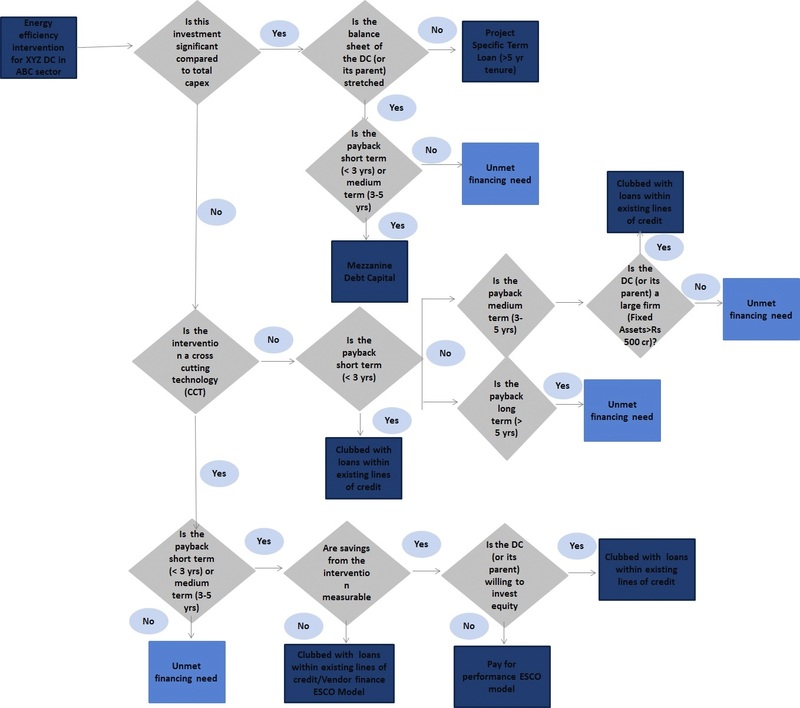 Sustainability Outlook and AEEE have developed a decision matrix which will help assess the most optimal route for financing energy efficiency interventions. To conclude, the issue brief defines the key levers to realize the investment potential in industrial energy efficiency to include policy push and standardization in EE project definitions. It suggests that a ‘market-maker’ is missing- to bring industry, financial institutions and ESCOs together. Collaboration is very important to take a combined responsibility for the bigger issue—i.e. enhancing the energy efficiency among industries in an ethical, responsible and definitely in a sustainable way. The issue provides updates on policy regarding terms and conditions for Exchange of Energy Savings Certificates and the roles of multiple entities associated with the trading. The brief also provides a sneak peek into some of the upcoming solutions including water-free fabric dyeing technology, deep eutectic solvents, top gas recycling blast furnace etc.